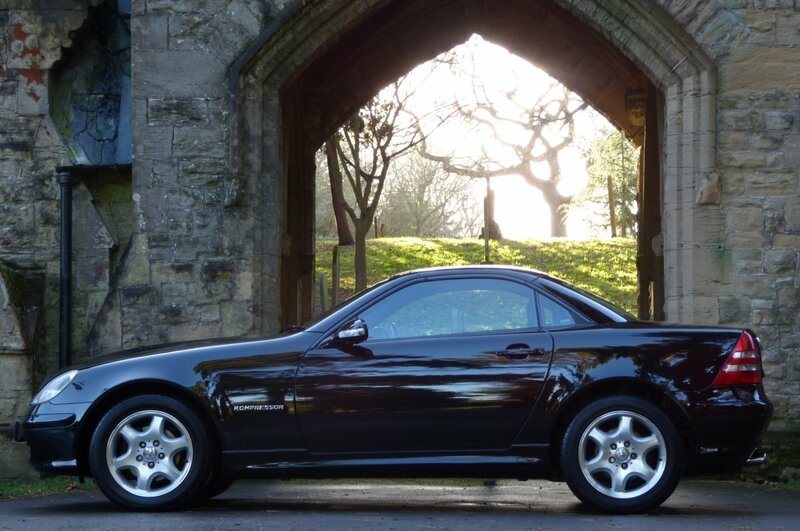 The First Generation Mercedes Benz SLK Or The R170 Was First Showcased To The World At The Turin Motor Show On The 22nd Of April 1996, With This Stunning New Addition To The Company's Line Up, To Be An Ultra New Design From Bruno Sacco And Was Viewed As Being A Modern Incarnation Of The Glorious 1950`s Mercedes Benz 190 SL. 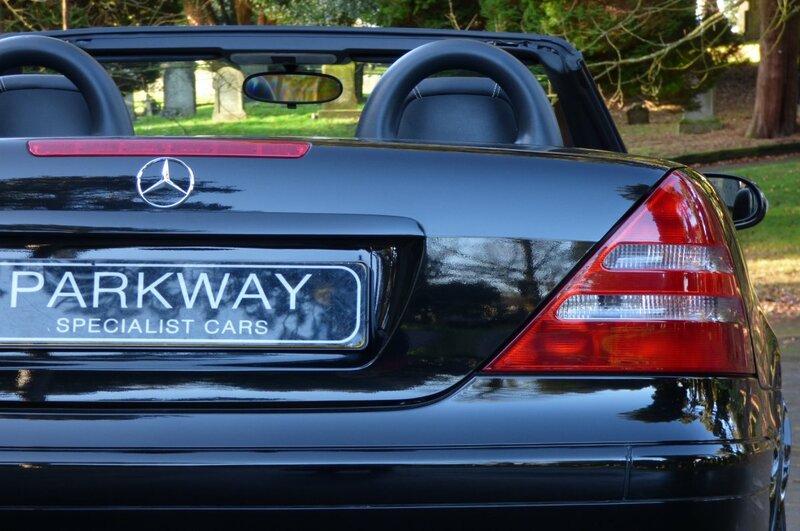 This Sleek New Model Offered Everything From World Class Mercedes Benz Build Quality, Up To Date Driving Technology, A Selection Of Engines To Please Every Driver And Of Course The Electric Solid Folding Convertible Roof, Which Could Be Fully And Easily Controlled By The Touch Of A Switch, All Of Which Gave Us A More Refined Driving Experience, Which Worried The Likes Of Porsche With Their Boxster Model. 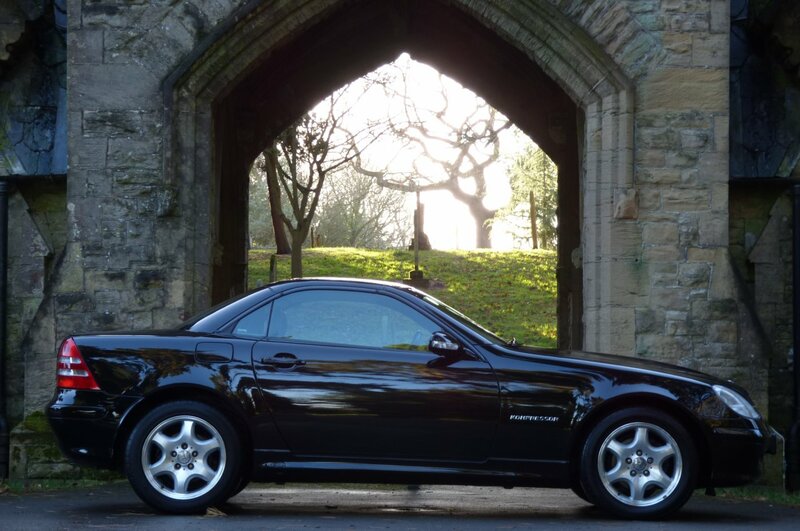 Mercedes Benz Had Successfully Achieved The Ultimate Driving Statement, To Which There Was Healthy Interest Within Every Global Mercedes Benz Dealer, Was Adored By The Motoring Press And If We Fast Forward To 2017, Every Aspect Of The Cars Design Has Defiantly Stood The Test Of Time And Still Offers A Truly Beautiful, Usable And Exciting Vehicle. 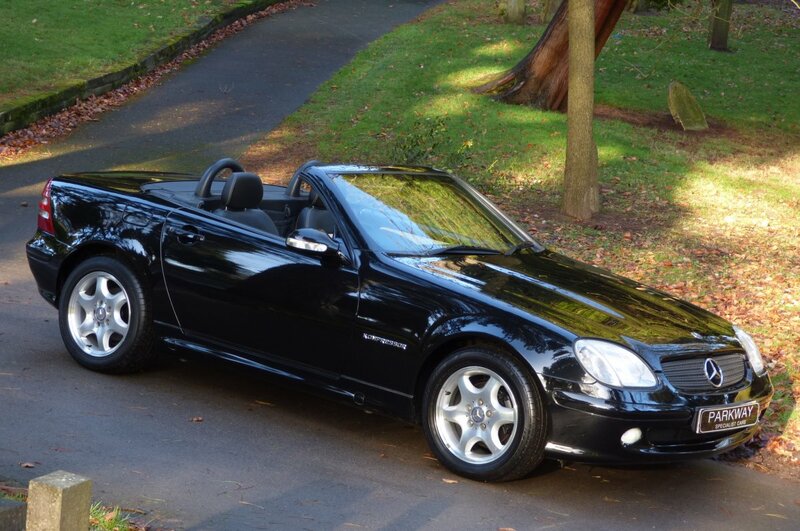 As Part Of The Model Line Up, Came The SLK 230 Kompressor Convertible, With This Mid Ranged Version Having A Two Point Three Litre, Four Cylinder Super Charged Petrol Engine Which Produced A Wonderful 197 Brake Horse Power, Which Would Mean That The Driver & Passenger Could Accelerate From 0-62 MPH In Just 7.2 Seconds And Would Keep Going Until It Hit The Electrically Limited Top Speed Of 145 MPH And All This Was Available With Or Without The Solid Convertible Roof In Place. 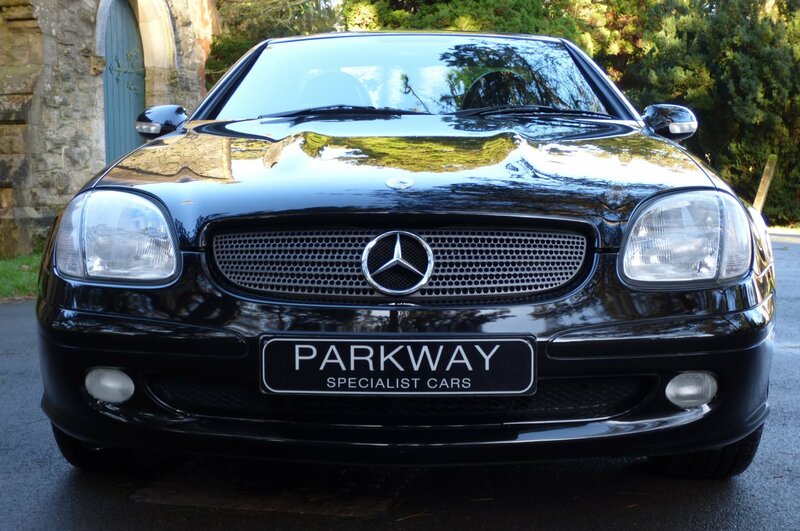 This Now Rare Find With Remarkable Low Miles Was First Supplied By Mercedes Benz Portway Central Milton Keynes In The June Of 2000 And Over The Last Seventeen Years Plus, This Rather Special Example Has Only Had 27772 Miles Applied Since New, Which Roughly Works Out At About 1577 Miles Per Annum. 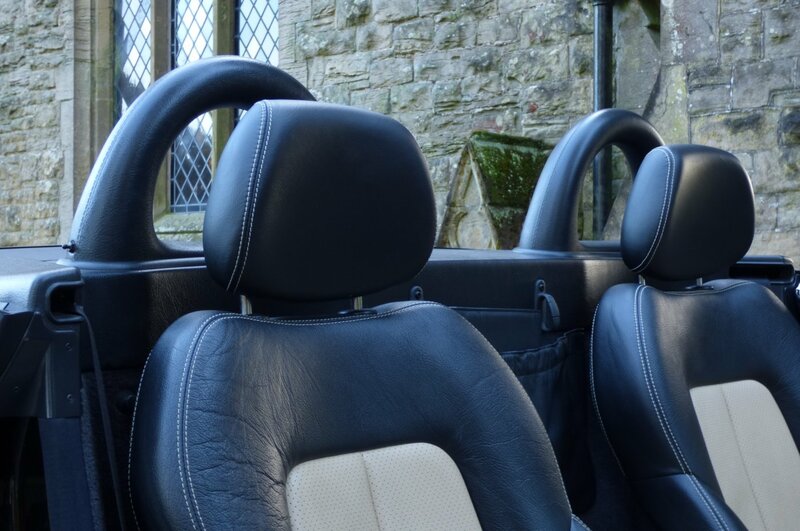 This Incredible Mileage Reading May Well Be Down To The Car Being Sorn For Many Years, With The Past Keepers Taking Immense Amount Of Care To How And Where It Was Dry Stored For So Many Years And This Today Is Evident To The Total Current Presentation, As All Elements To Include The Body Work, Inner Arches, Body Panel Fit, Leather Seating, Carpets, An Original And Undamaged Under Belly And Further Internal Trim Parts Are In Stunning Original Condition, Which In The World Of The Older Mercedes Benz Collectable Classic Cars, Is Defiantly Rare To Now Find. 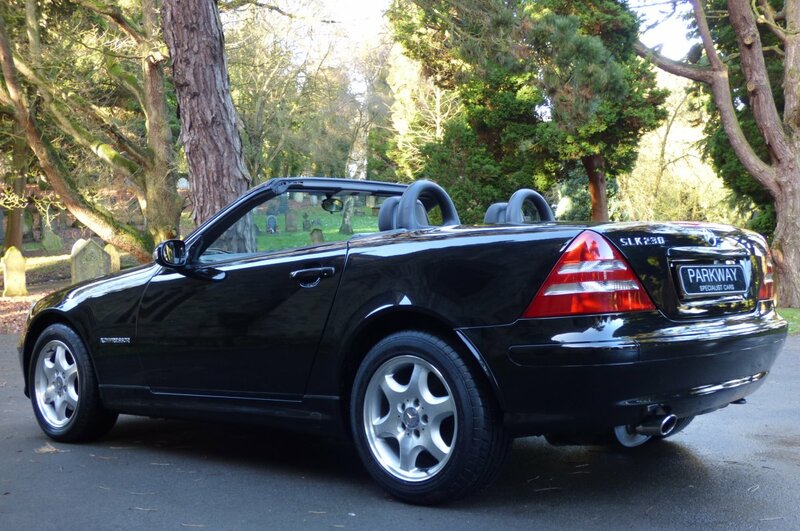 Regardless Of This The Car Has Still Had Past Historical Completions Of MOT Work With Mileage Readings Logged At 24282, 25062, 25260, 25546, 25728, 25885, 26354, 26464, 26517, 26651, 26751, 27131, 27359, 27533 & 27642 Miles, With Many Of The Sheets Having No Advisory Notices To Report Of.  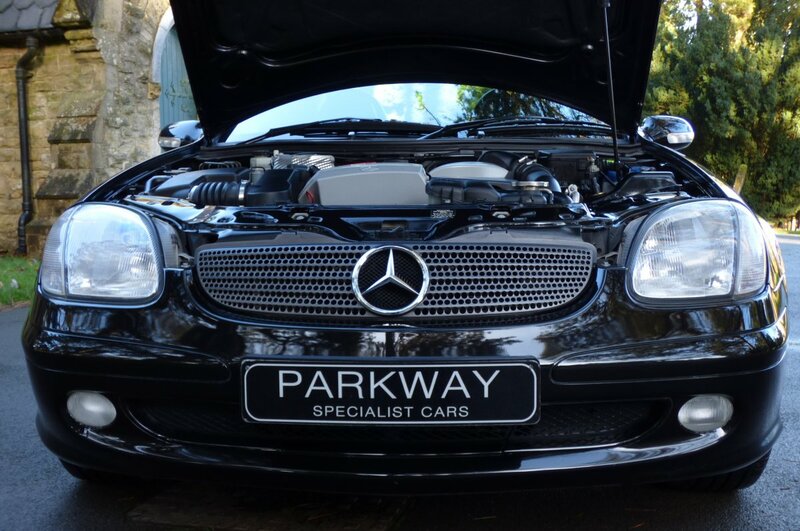 Once Sold This Excellent Addition To Any New Or Established Vehicle Collection Will Have A Full Engine Service Completed By Our Fully Trained & Knowledgeable Workshops, All Ready For That Very Lucky New Keeper To Start Enjoying. 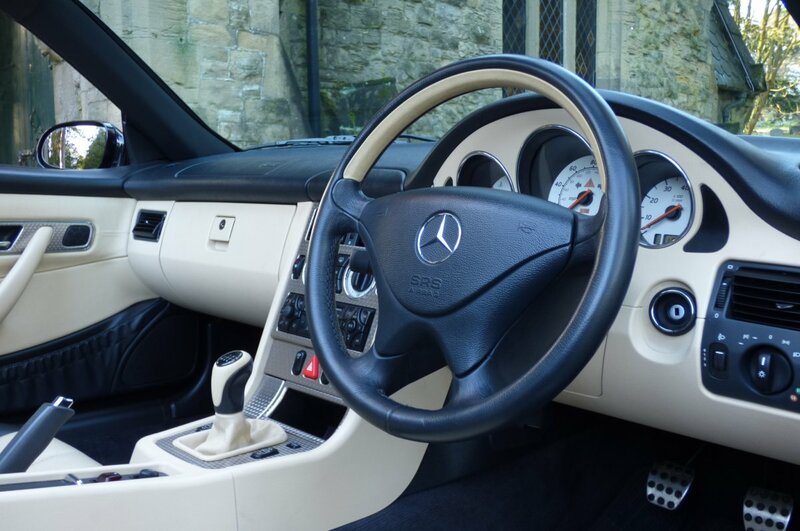 The Interior Finish Is Stereotypically German, With The Use Of Of Finest Materials In A Usable, Yet Comfortable Cabin Space. 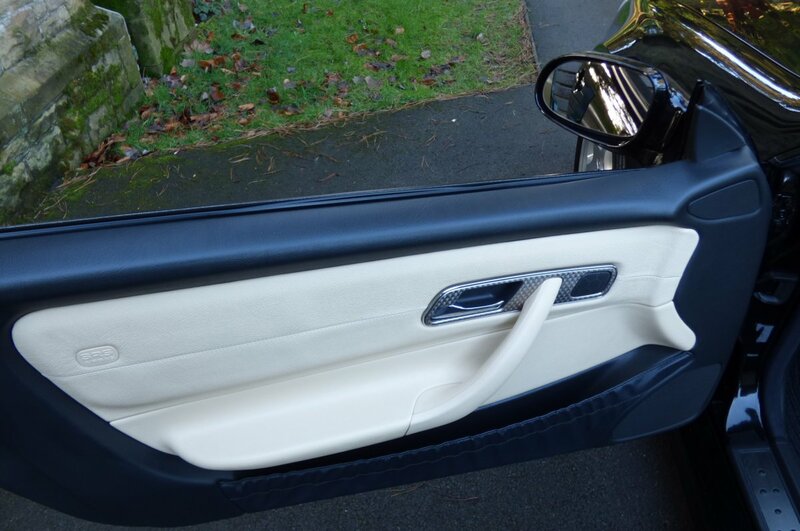 From Factory This Fine Example Was Opted With The Two Tone Quartz Black & Siam Beige Leather Sport Seats Beautifully Complemented With Contrast Beige Twin Needle Stitch Detail, The Black Carpets That Have Been Protected With The Mercedes Benz Over Mats, The Two Tone Quartz Black & Siam Beige Dash That Wraps Around The Elegant Cabin, The Two Tone Quartz Black & Siam Beige Leather Trimmed Door Cards, The Beige Fabric Roof Lining And Presented With The Weave Patterned Aluminium Interior Inlays, That Finish This Splendid Effect. 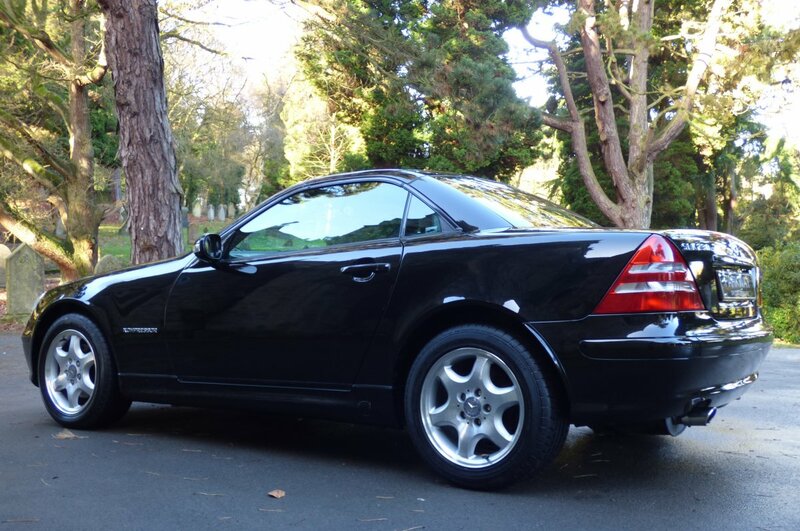 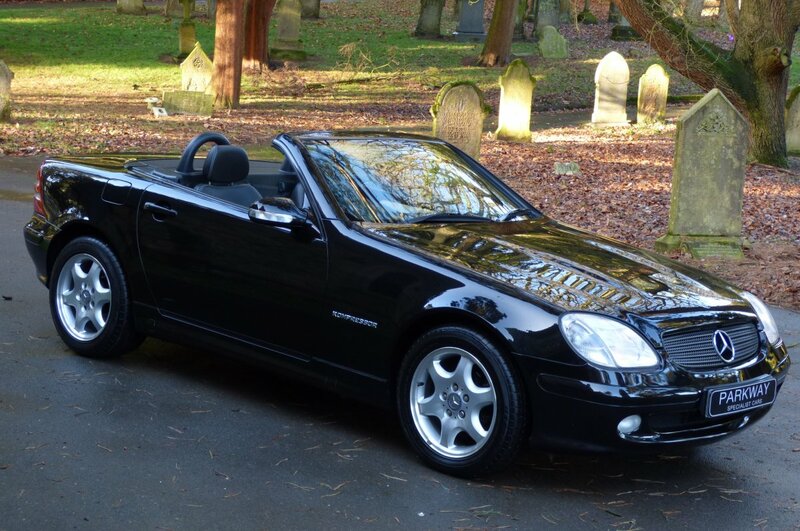 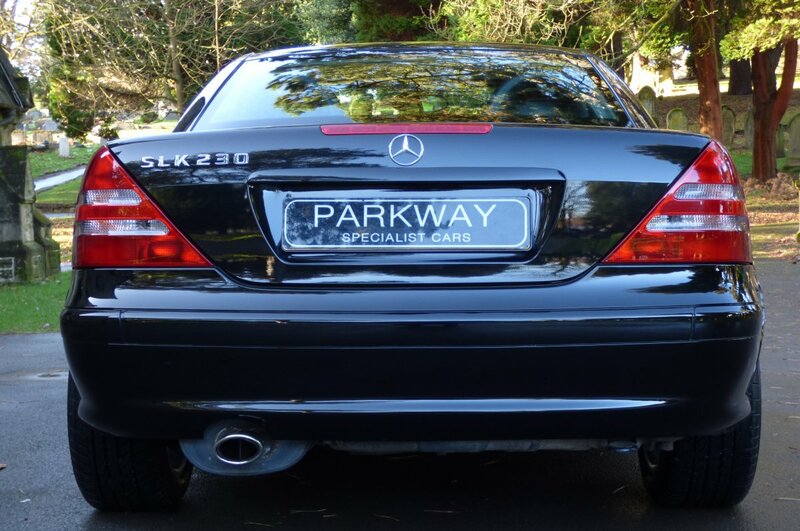 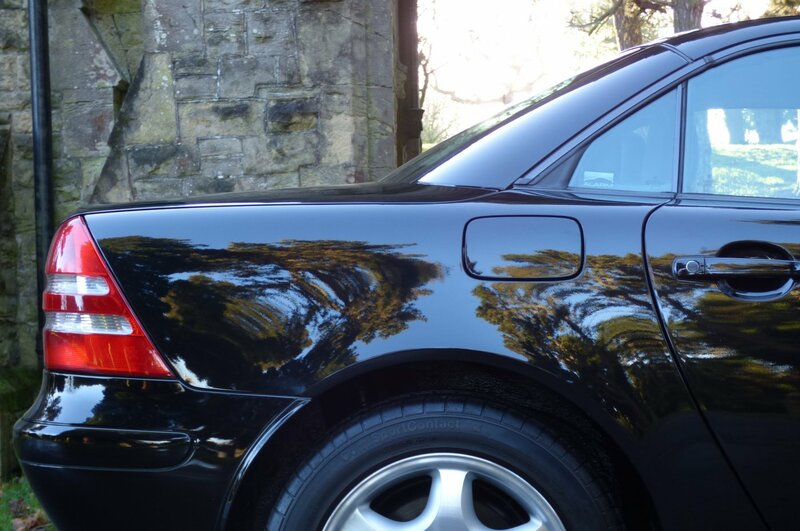 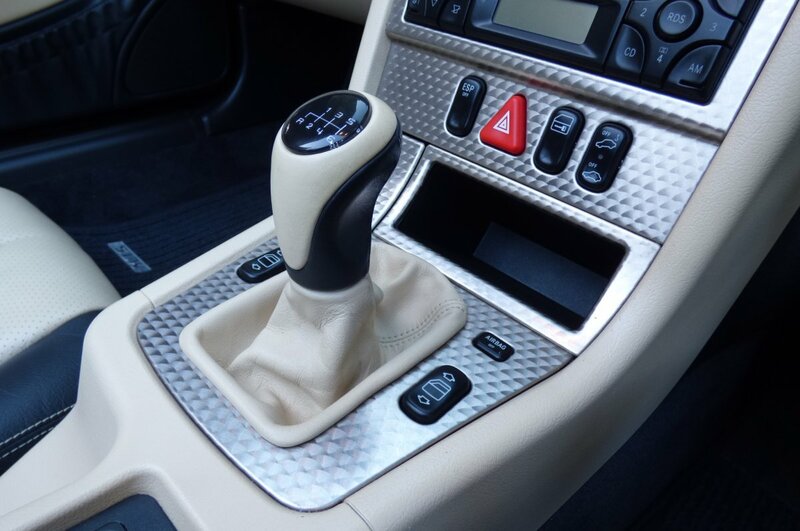 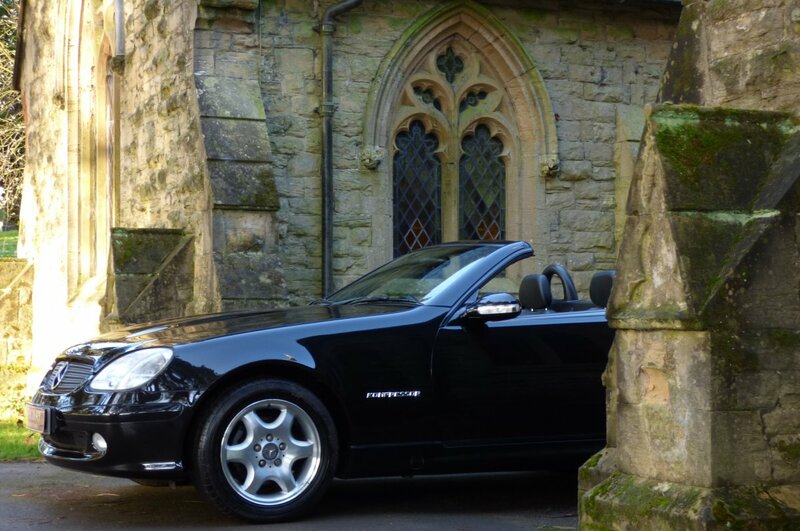 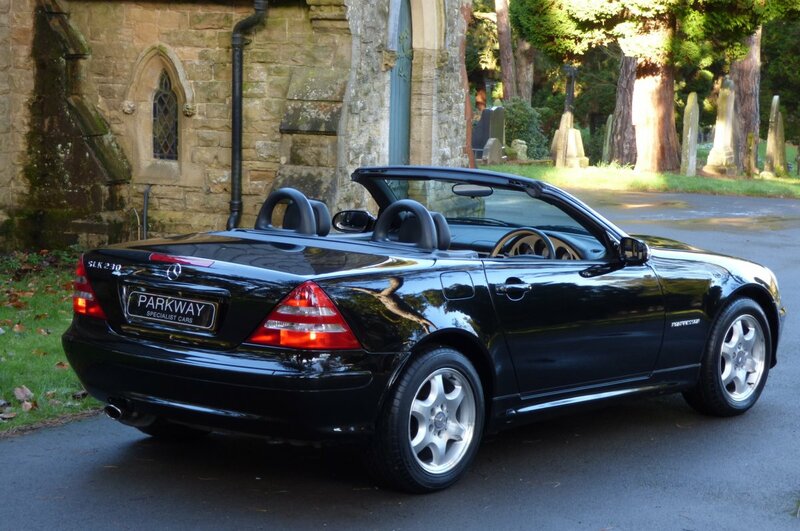 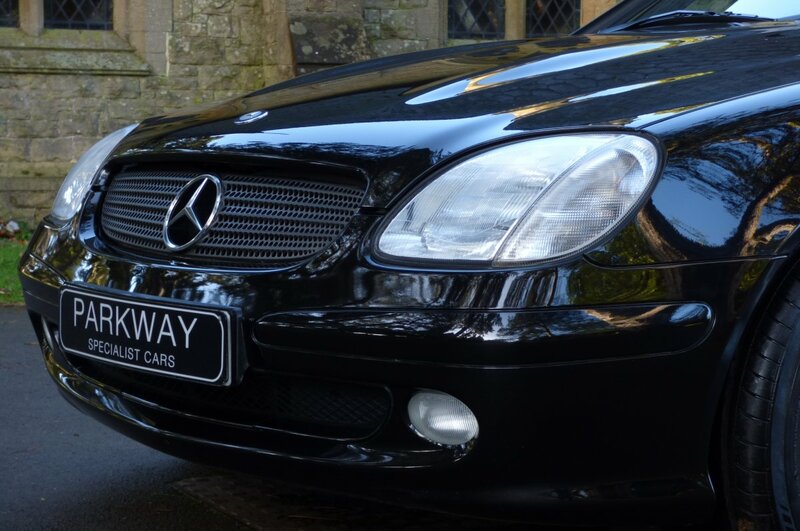 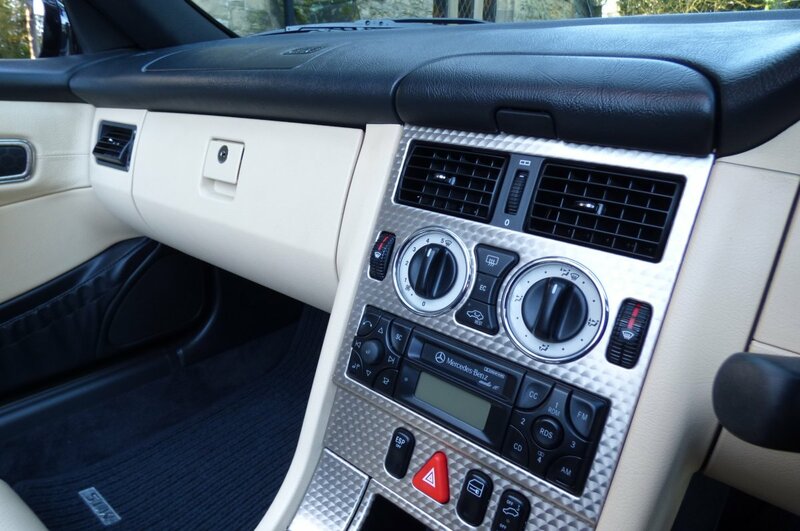 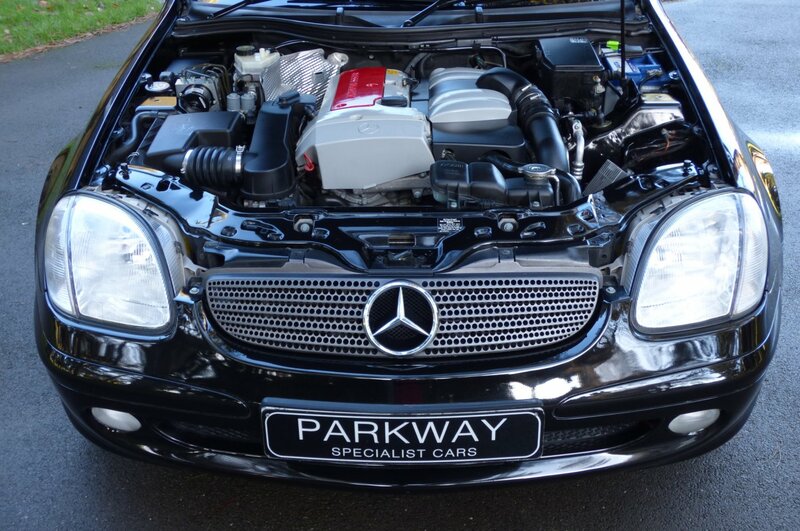 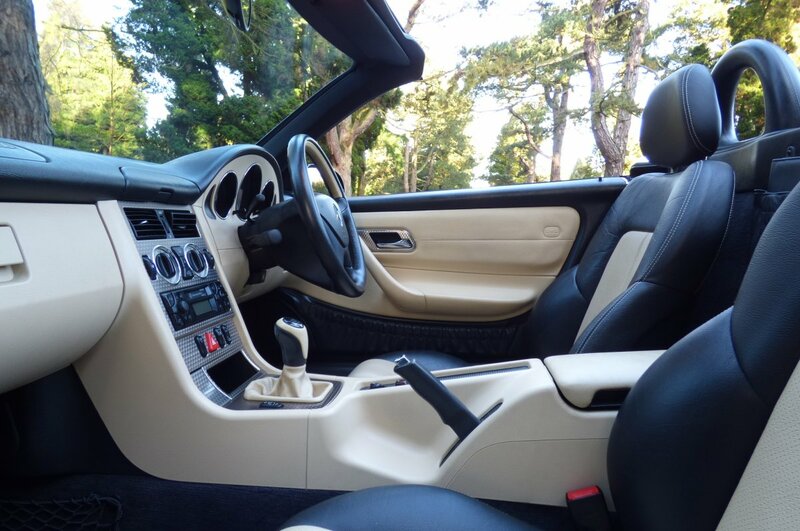 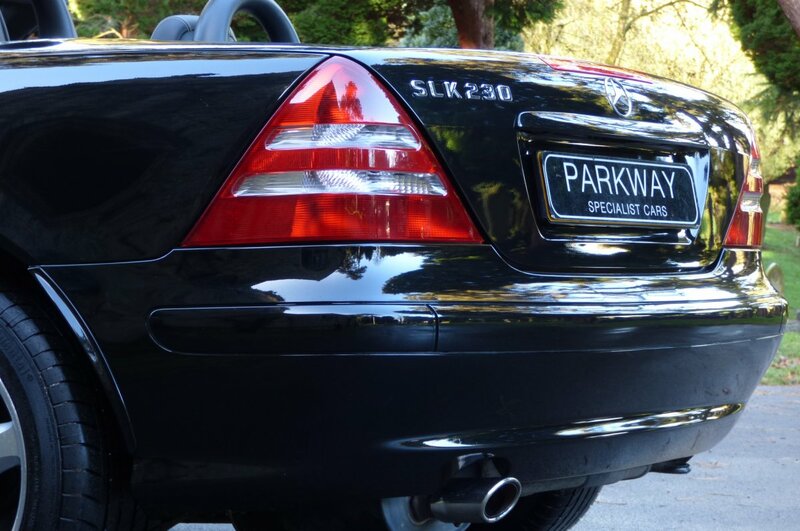 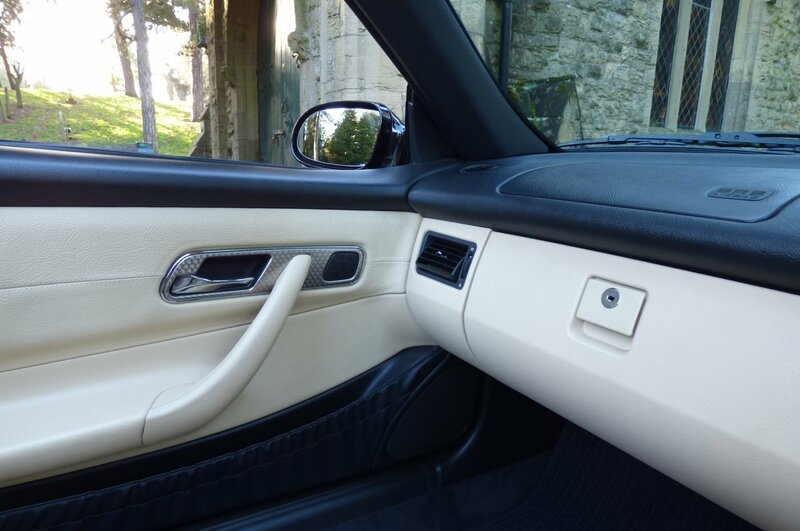 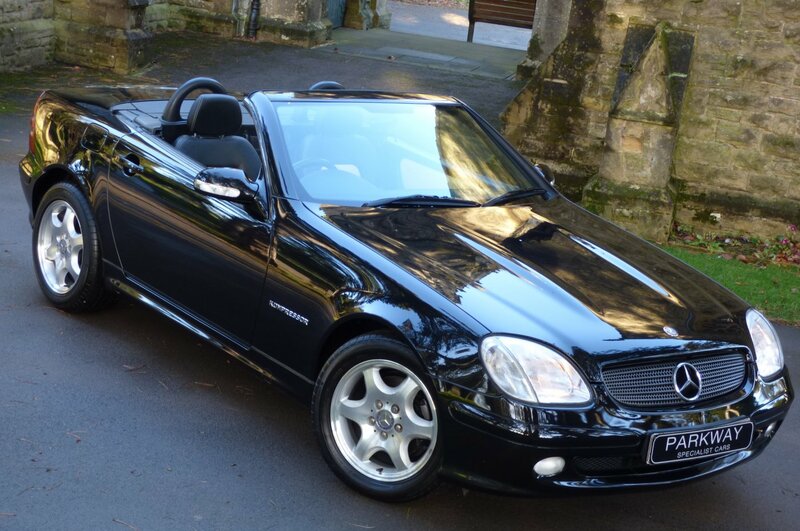 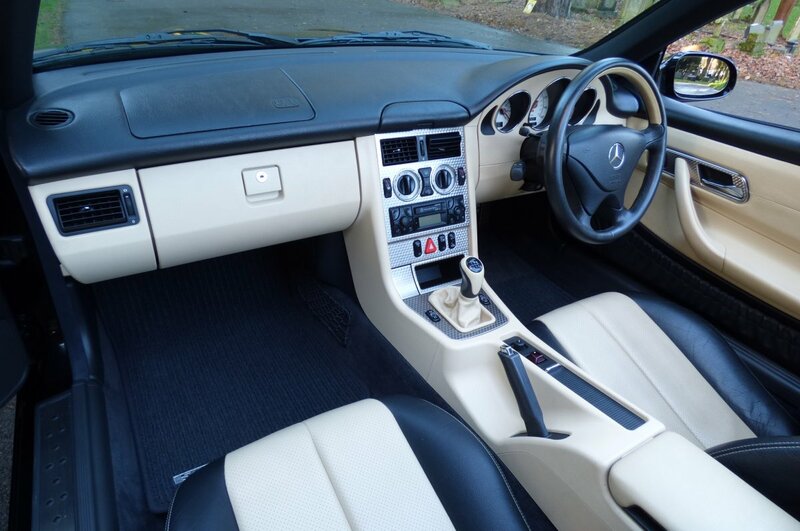 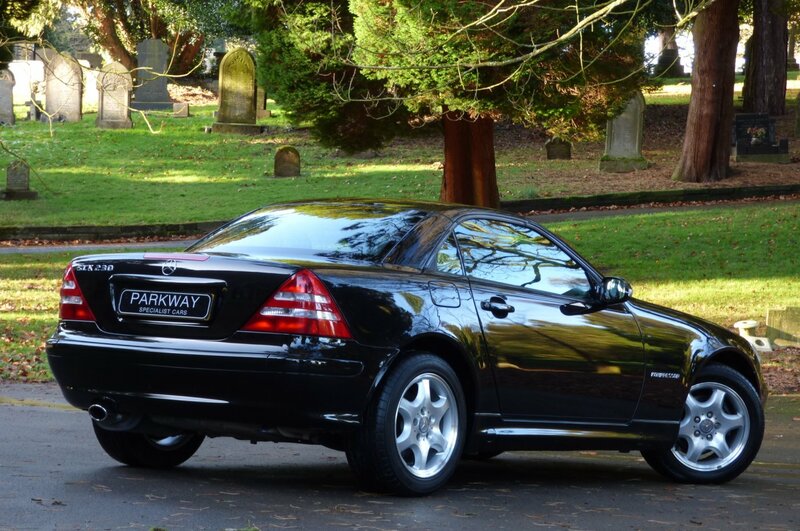 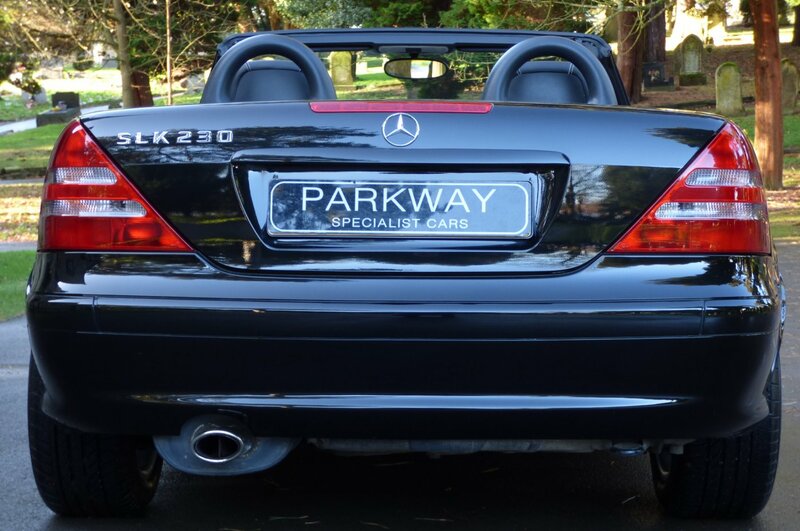 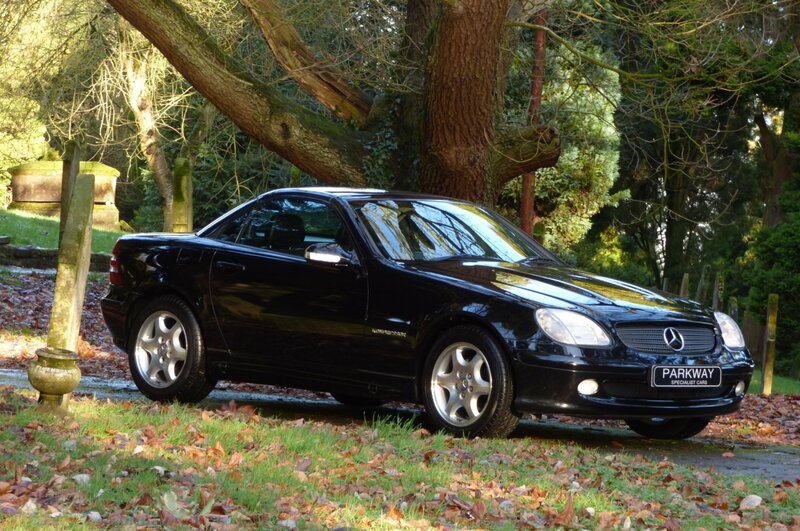 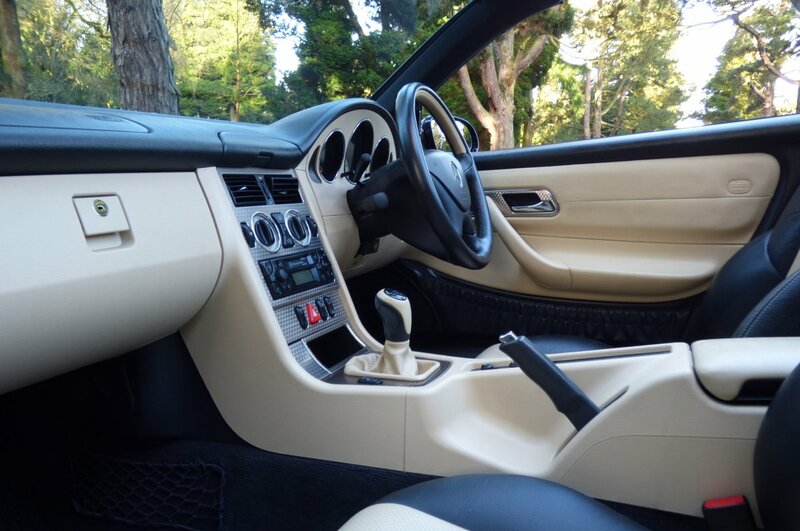 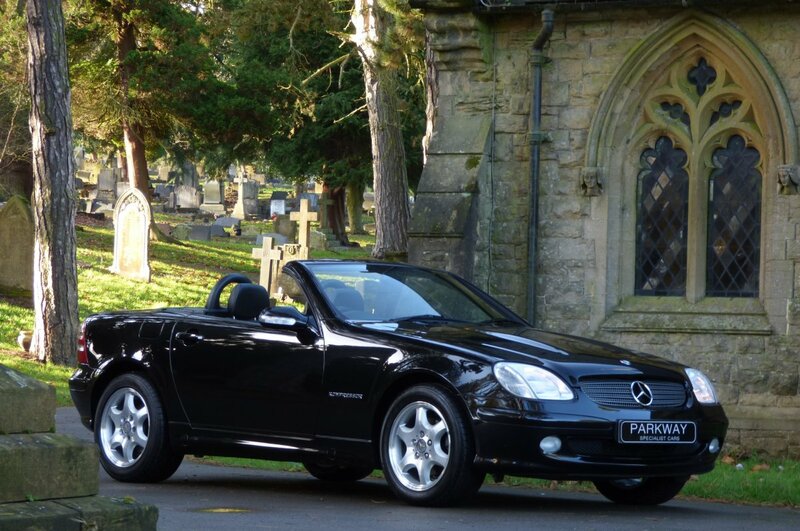 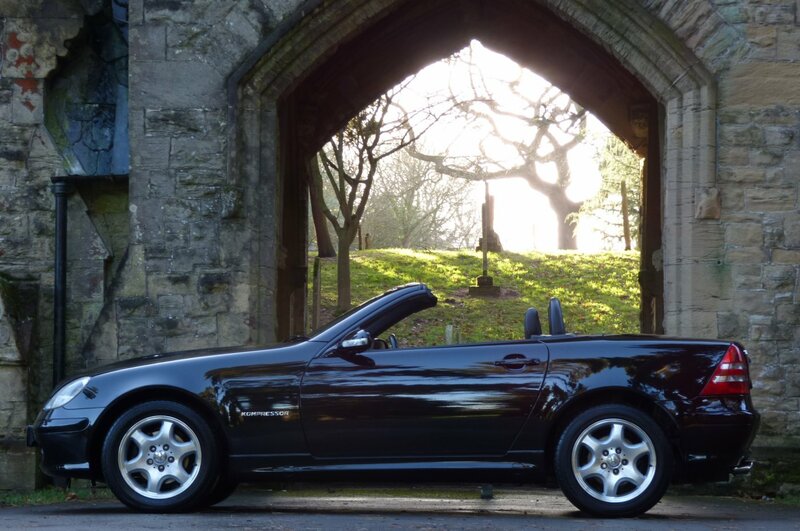 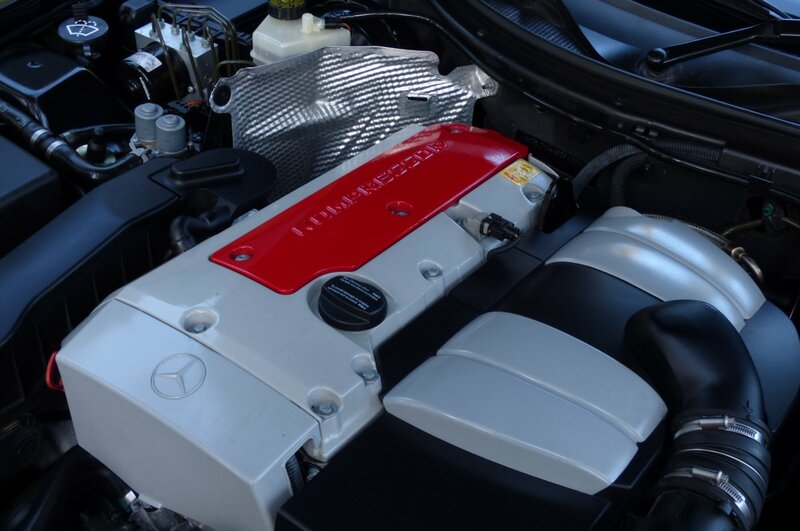 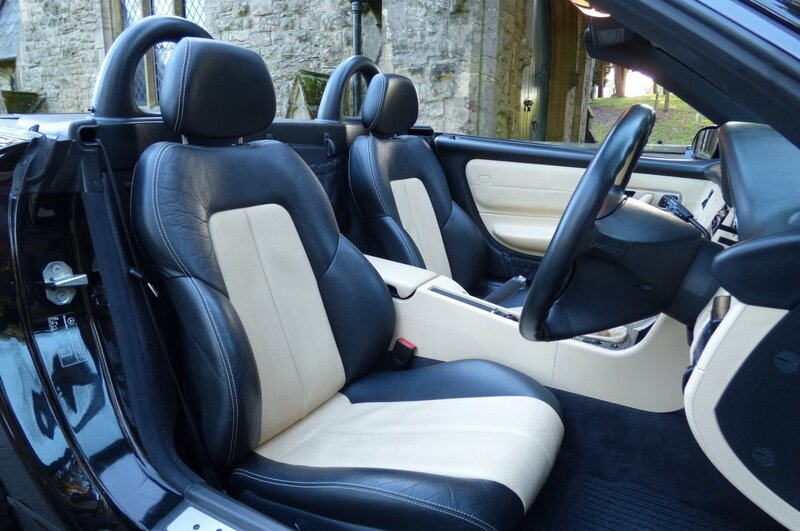 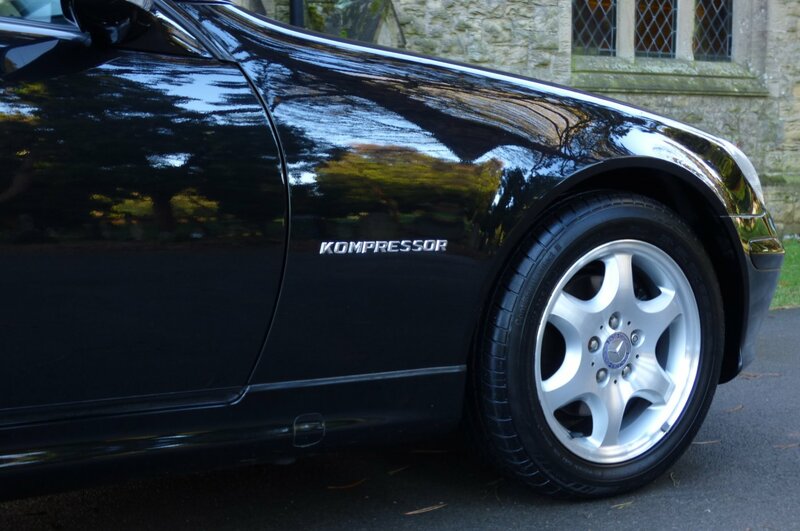 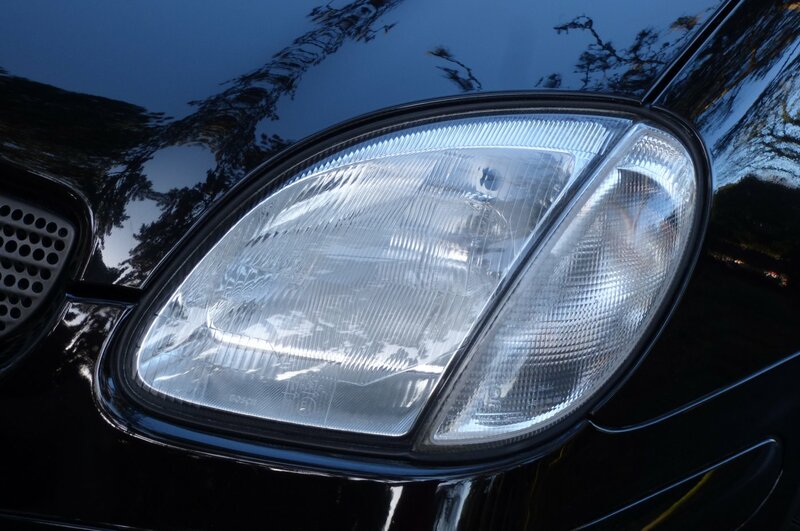 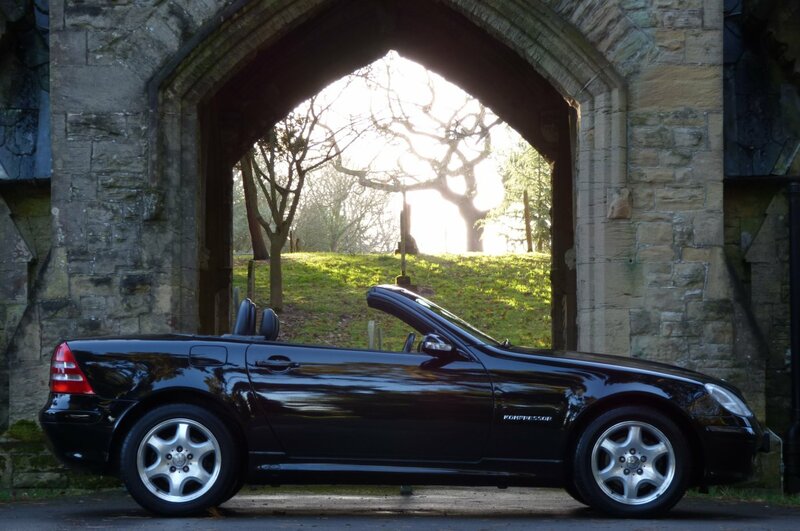 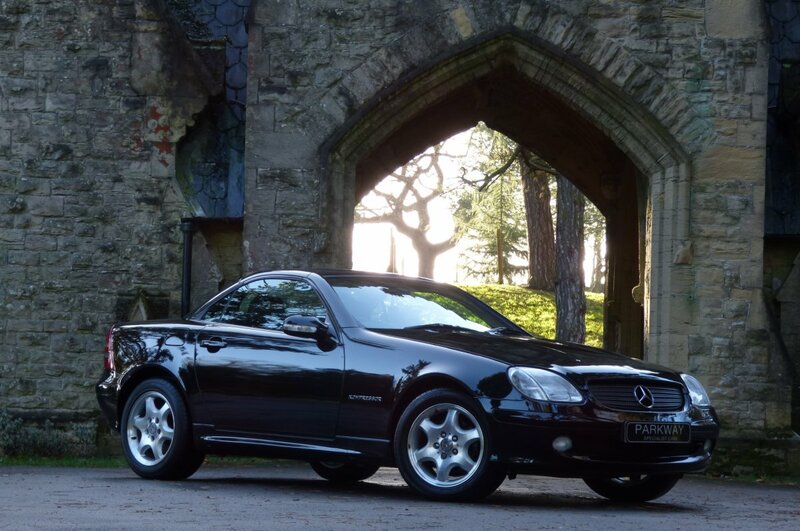 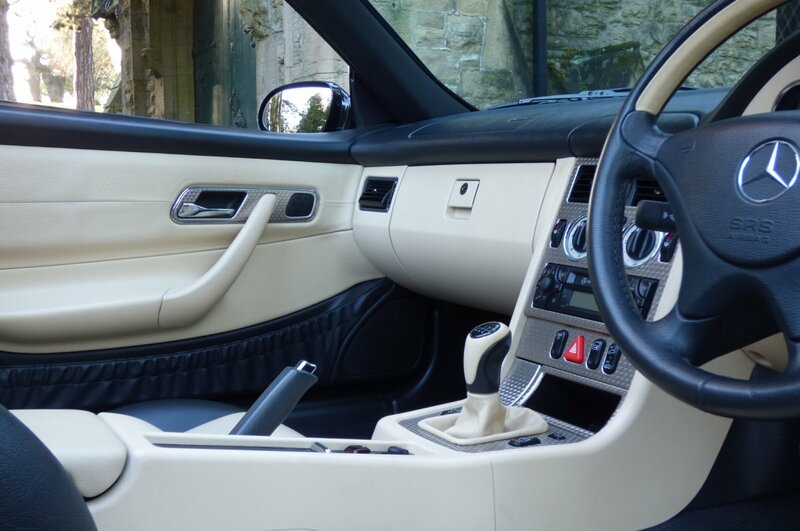 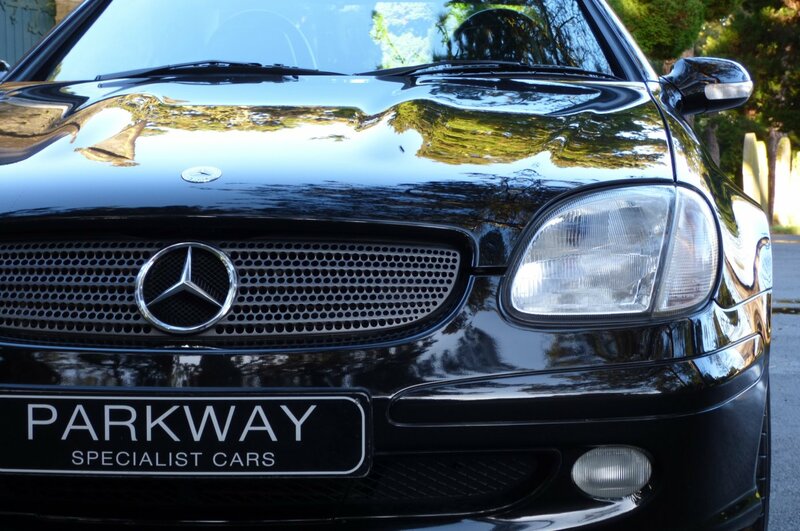 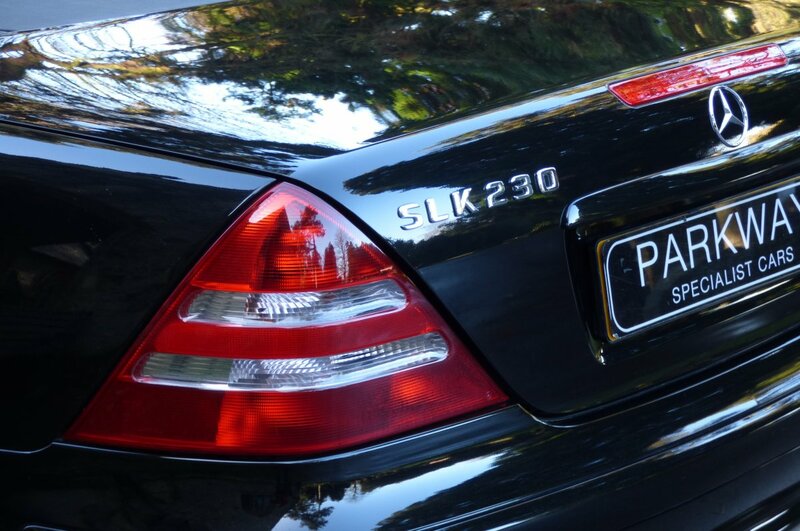 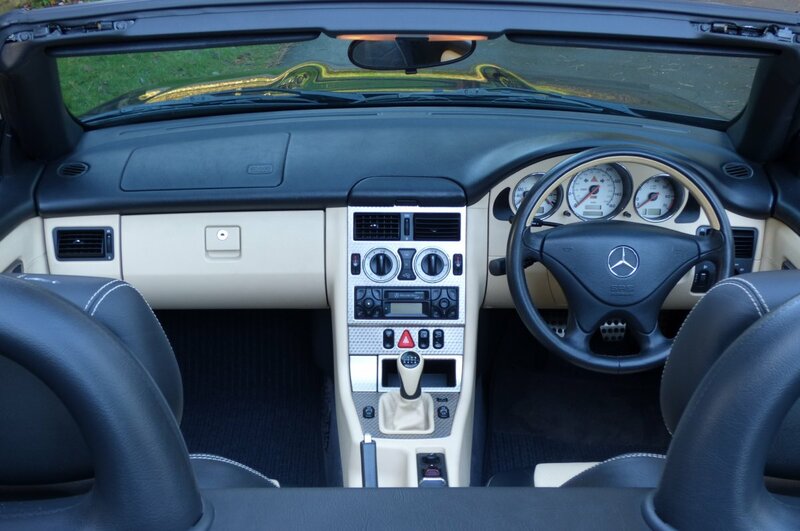 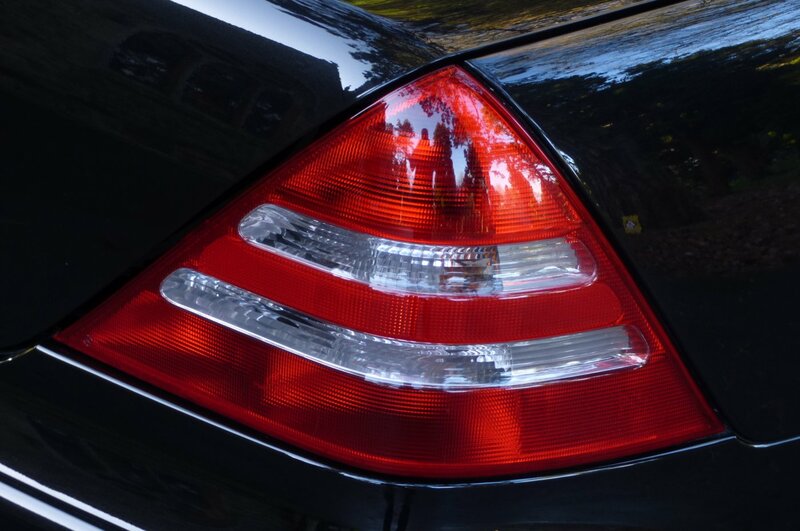 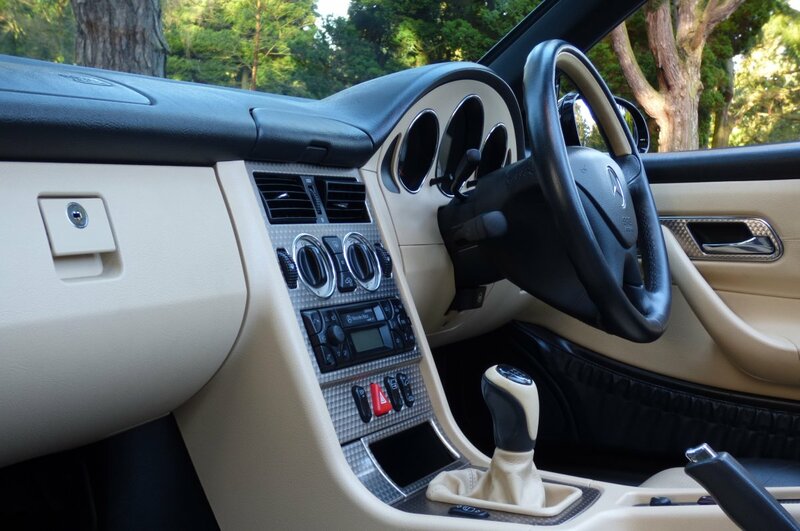 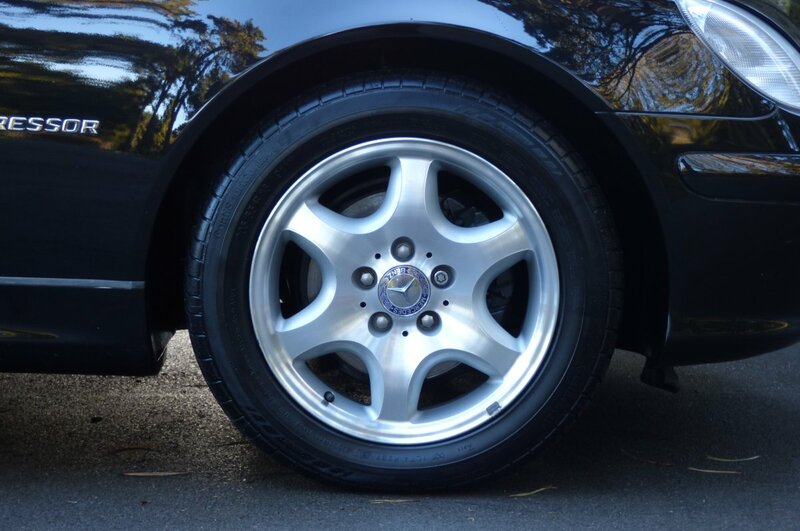 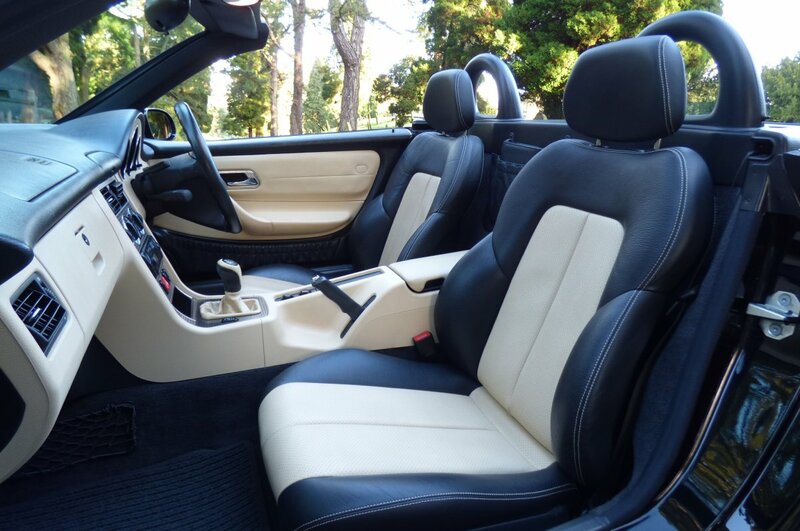 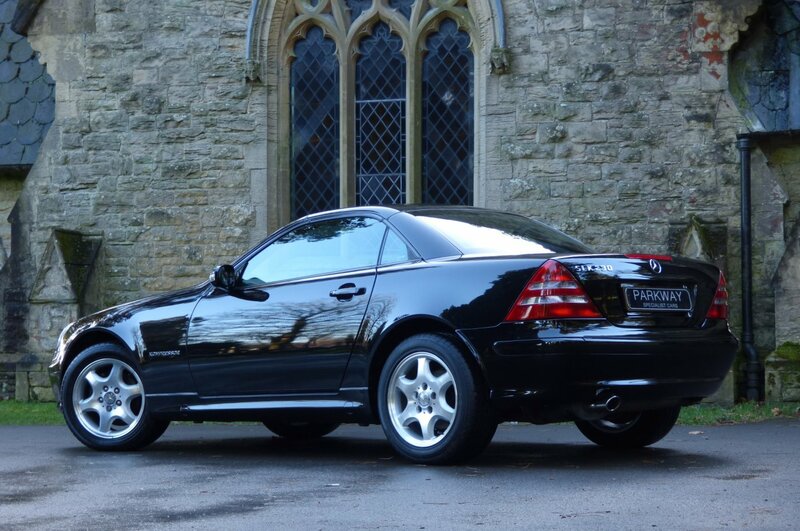 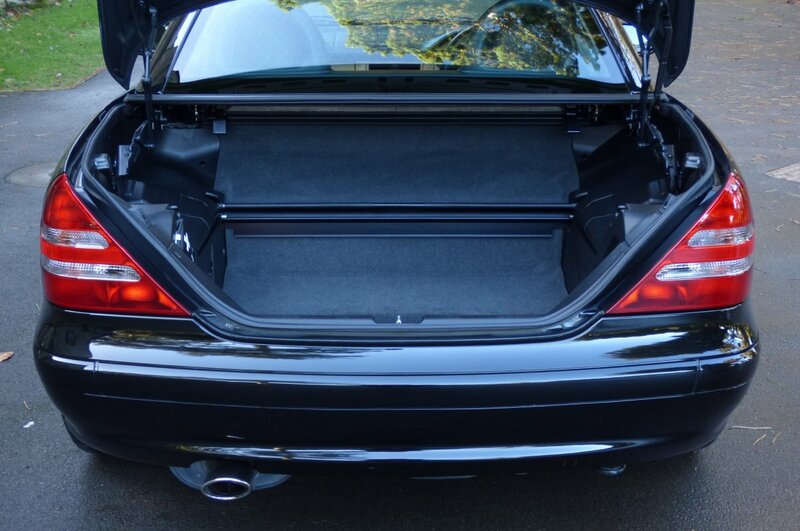 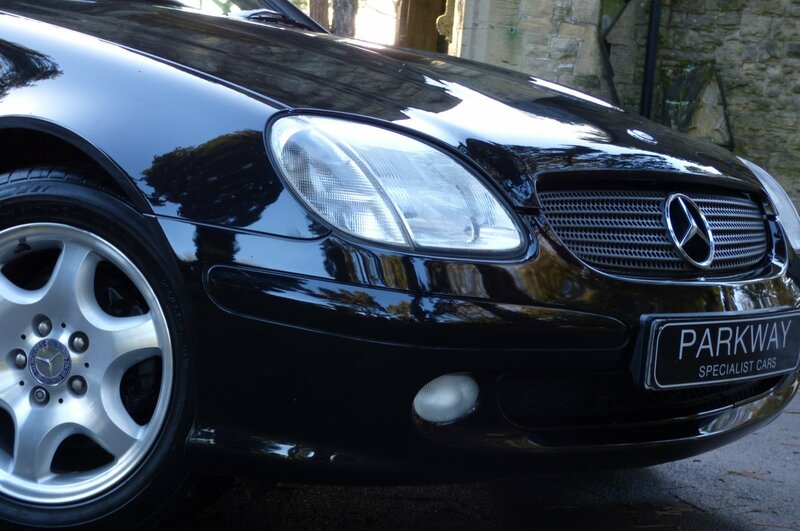 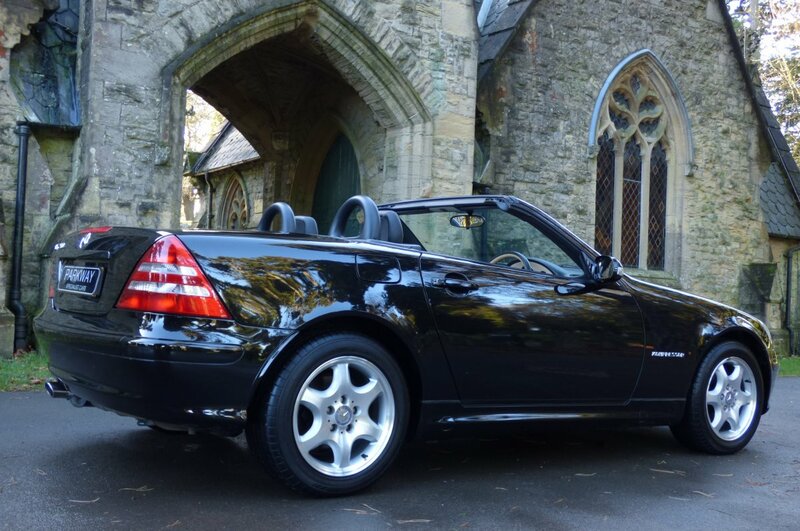 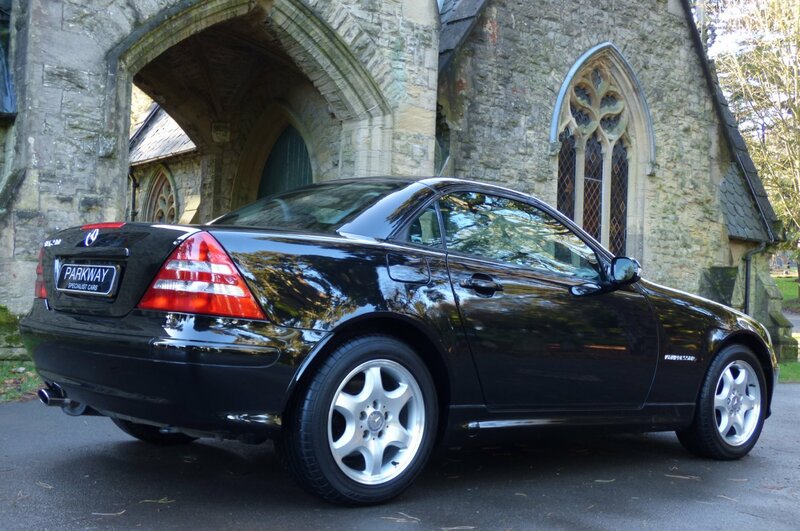 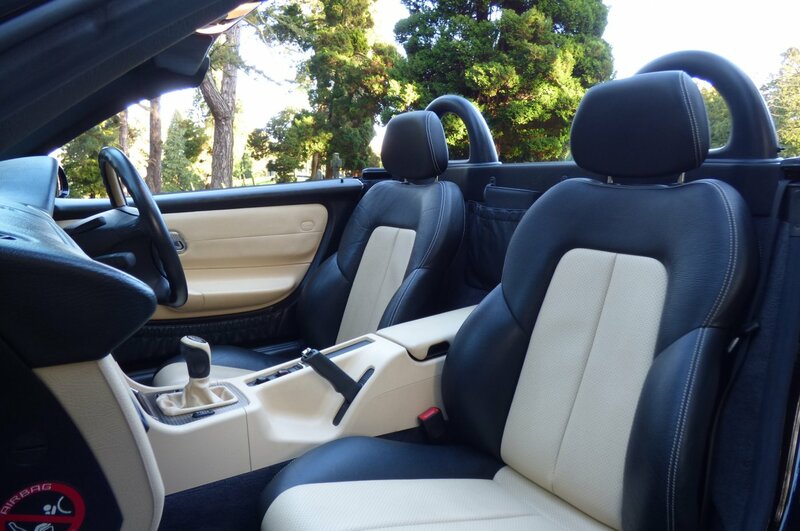 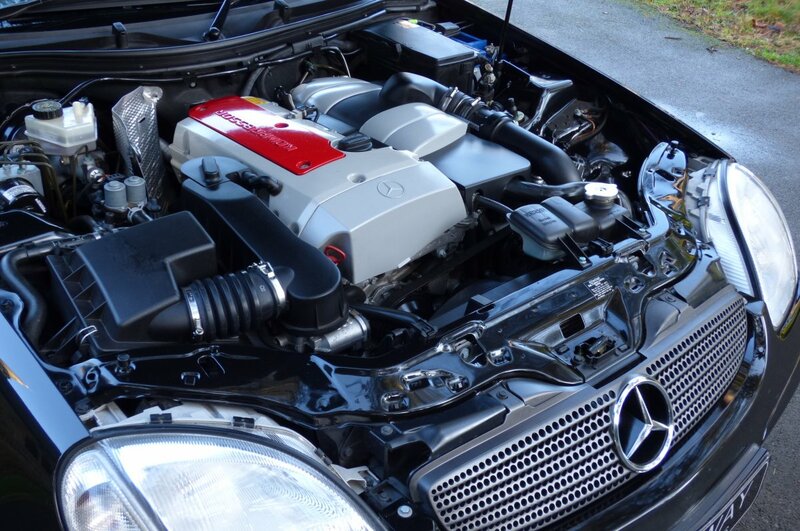 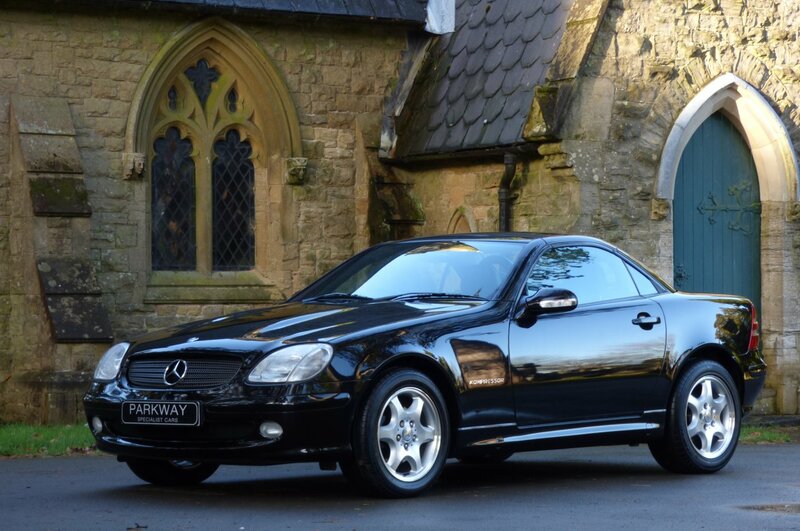 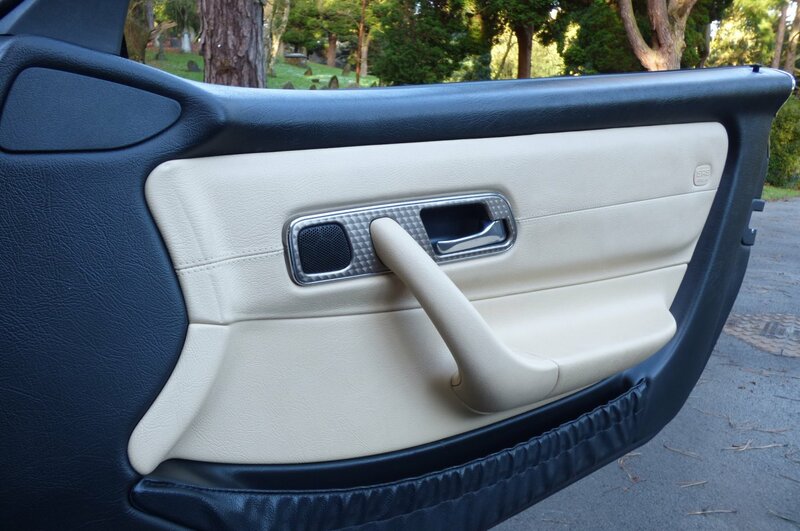 Of Course The Low Miles Will Be Of Great Interest To That Next Lucky Keeper, But Also This SLK Becomes Even Rarer, As From Factory Build The Vehicle Was Opted With The Six Speed Manual Transmission, Thus Making It Highly Individual And In Many Respects Remarkably Unique.. 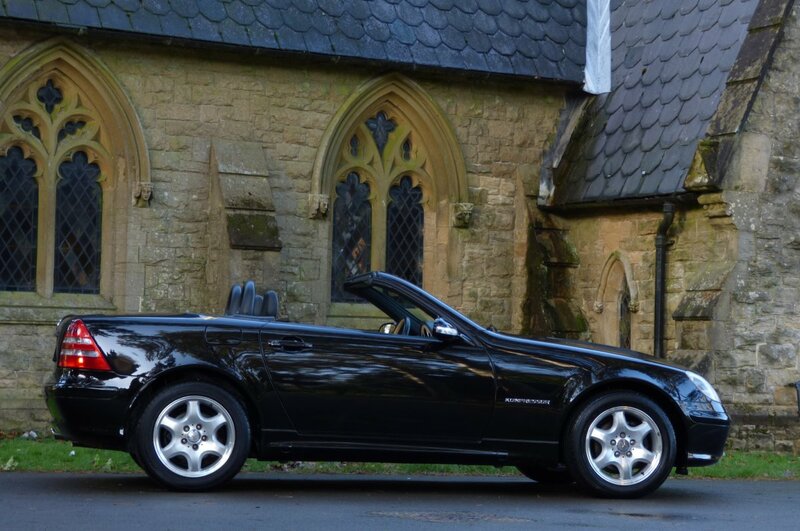 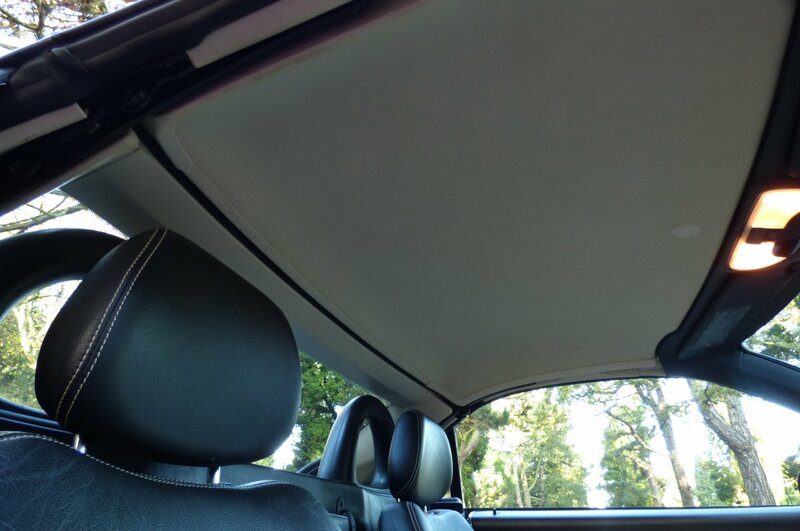 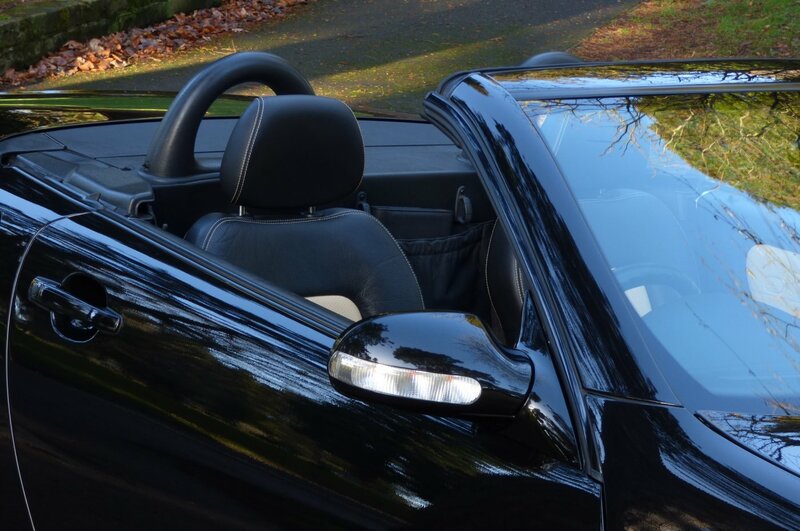 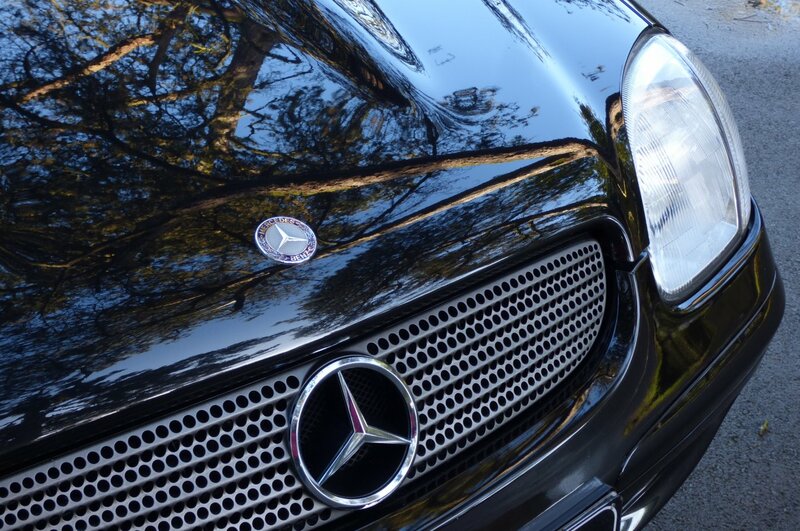 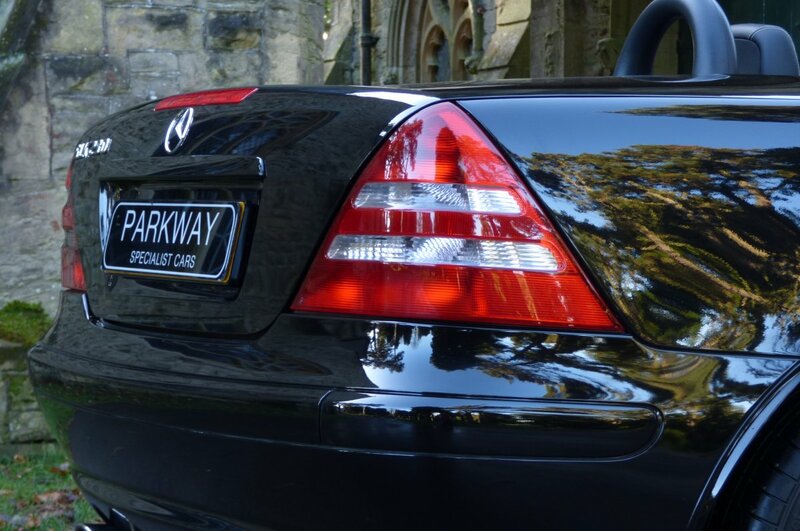 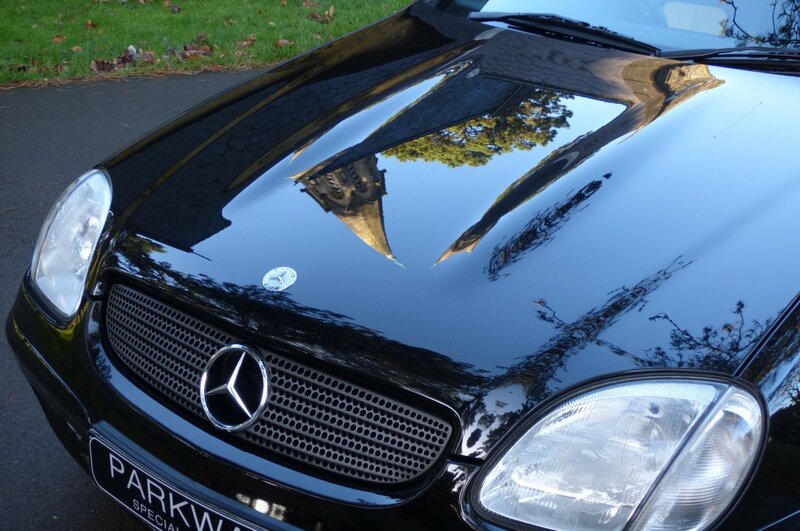 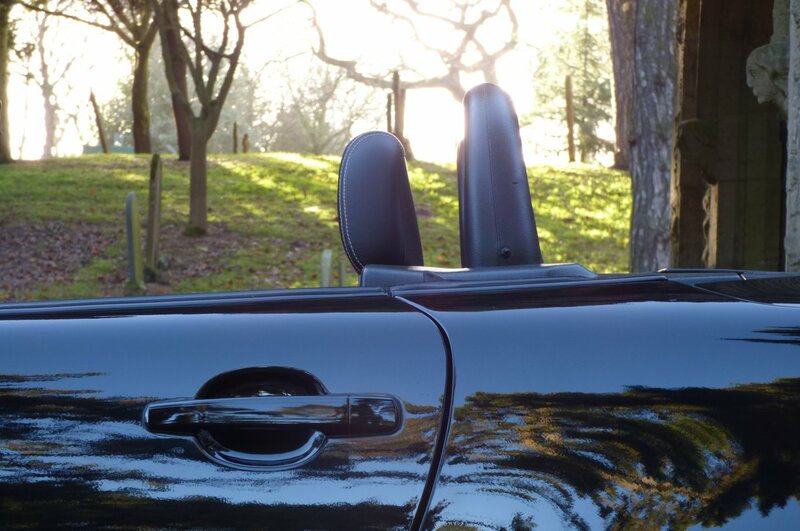 The Body With The Signature Sculptured Bonnet Is Presented In The Obsidian Black Metallic, Which Perfectly Showcases The Elegant SLK Curves, The Distinctive Mercedes Benz Lines And Looks Stunning With Or Without The Solid Convertible Roof In Place. 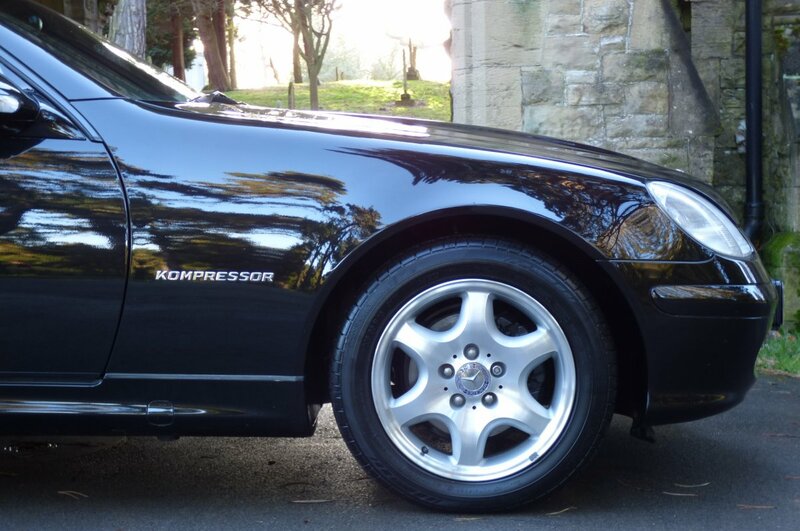 Further Exterior Detailing Is Presented With The 16" Six Arm Mercedes Benz Alloy Wheels Which All Sit On Branded Tyres, The Colour Coded Rear Arch Spats, The Blackened Honeycomb Front Grille Decorated With The World Famous Three Point Star Motif, The Chromed Kompressor Front Wing Badges, The Black Brake Calipers, The Chromed Singular Oval Exhaust Tip And Finalised With The Chromed SLK230 Badges That Finish This Fabulous Stance. 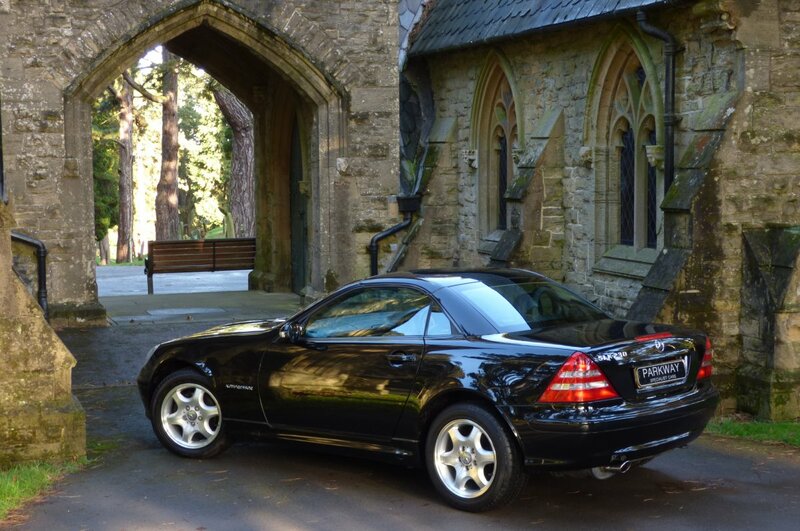 The Exterior Design Has Now Meant That The First Generation SLK Has Become An Instant Collectable Model On A Global Scale And With The Car Being Presented In Stunning Total Condition, This Should Be Viewed As Being An Interesting Proposition To That Next Breed Of Enthusiastic Buyers.